This policy was last updated 21 Dec 2016. A web cookie is a small piece of data sent from a website and stored on the user's computer by the user's web browser while the user is browsing. Cookies work sort of like reminder notes, written by the server, for the server. The server creates these notes, then sends them to your computer. Every time you go back to the server, or go to another page, you send the cookie back to the server. That way, the server can keep track of information from your earlier visits. Every time you go to a web page, it is a new experience for the server. Using just basic web protocols, the server has no way of knowing if you have just spent an hour picking out 22 things to buy, or wherther this is your very first visit to the web site. But, with cookies the server can keep writing reminders to itself about what you did earlier (where earlier might mean two seconds ago). Cookies can keep track of whether or not you are currently logged in, if you have put goodies in a shopping basket, and many other details. A cookie includes instructions from the server about how long the client computer should keep the cookie before discarding it. Originally, most cookies were used to maintain current information about a particular session on a particular web server, so there wasn't much use in having them stay around forever. However, programmers realized that by having cookies stay around longer and by having them be able to share information among different web servers, they could be used to create a more coherent experience for users, across multiple web servers. 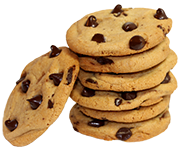 Because these kinds of cookies can keep long-term track of where a user had been, they are called tracking cookies. Tracking cookies are one of the reasons why, when you visit, say, a newspaper site, you see often ads popping up offering to sell you things that you just investigated using a search engine, or that you just looked at on Amazon. Tracking cookies can be useful, but they are also a little creepy — kind of like having someone follow you around constantly, taking notes on every place you go and everything you do, then calling ahead to let the folks at Macy's know that you just spent an hour at REI looking at camping gear. Anyone who remembers the days of ftp or gopher wins a special gold star for demonstrating mastery of tech history.